Bamberg (heinnews) – Joan Plaza was still trying to figure out how his Unicaja Malaga team could lose by 20 points to Brose Baskets Bamberg in the Euroleague. On the way to the team bus departing Brose Arena, the Unicaja coach seemed happy to change the subject – namely to the excellent advancements of the club’s young guard Romaric Belemene. “I really like his development,” Plaza said about the 1997-born Belemene. 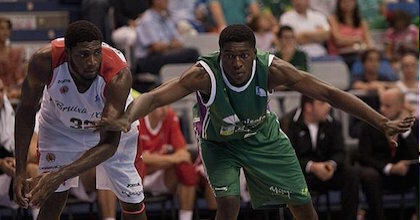 Belemene is playing with Unicaja’s LEB Silver team CB Clinicas Rincon Malaga in Spain’s third division after the team dropped from the LEB Gold last season. The Republic of Congo native is leading the Clinicas Rincon team in scoring with 16.1 points while also collecting 5.3 rebounds, 0.7 assists and 1.3 steals per game. Belemene also is committing 3.1 turnovers per game while shooting just 23 percent on three-pointers (10-of-43) and 48 percent on free throws. Belemene’s best showing this season came against Valladolid as he scored 33 points including 3-of-5 three-pointers to go with eight rebounds, one assist and two steals. Last season in the LEB Gold, the 2.02m swingman averaged 7.2 points in 23 minutes per game while also chipping in 4.5 rebounds, 0.4 assists, 0.9 steals and 0.9 blocks. Belemene turned the ball over 1.5 times while shooting 23 percent from three-point range and 58 percent from the free throw line. But the biggest between this and last season, Plaza said, was the make-up of the Clinicas Rincon roster. Last season, the team included 39-year-old Ricardo Guillen, 28-year-old Alfonso Sanchez and 23-year-old Tautvydas Sabonis. Not only was Guillen the LEB Gold’s leading scorer, but that trio were the top three scorers of the team. They scored 36.8 of the team’s 66.4 points per game – an average of 55 percent. This season, Clinicas Rincon only have 39-year-old Juan Jimenez and 27-year-old Carlos Cobos besides a group of 20-and-under players which also includes 20-year-old swingman Mo Soluade from Great Britain, 18-year-old Democratic Republic of Congo 7-1 center Viny Okouo, Romanian 17-year-old 6-foot-11 center Uta Rares, 18-year-old Spanish point guard Carlos Corts and Serbian 19-year-old 6-foot-10 big man Kenan Karahodzic. Cobos is averaging 6.7 points, 4.3 rebounds and 2.4 assists while Jimenez has collected 4.7 points, 2.8 rebounds and 1.5 assists – meaning the youngsters are given more responsibility than last season. “We have put (Romaric) on a team with a lot of young players and they have to come up with solutions to situations. We have taken away the older players from the team, who last year were there to solve the problems,” Plaza said. Belemene showed last season in the Adidas Next Generation Tournament that he can lead a team. He averaged 15.3 points, 5.7 rebounds, 1.4 steals and 1.6 blocks at the Rome qualifying tournament and the ANGT Finals at the Turkish Airlines Euroleague Final Four – in his third and final go-around in the U18 tournament. At the Final Four, Unicaja regularly was a team that came back in games, with Belemene leading the way with his superb athleticism and passion for the game. He would regularly throw his body around for loose balls and play tough defense. Plaza said Belemene is on the road to becoming a better player. The 18-year-old is regularly practicing with Unicaja’s top team, which gives him a chance to learn from the veteran players the things he needs to speed up his development even more.